Vampirina is a show that debuted last year on Disney Channel and Disney Junior. It is a hit show that ranks among the top five series for girls aged 2 to 5. Disney Parks Blog announced that the start of the show would be coming to Walt Disney World just in time for Halloween. Starting September 30th, Vampirina (also known as Vee) will be at Disney’s Hollywood Studios. She will join the line-up during the character breakfast at Disney Junior Play ‘n Dine at Hollywood and Vine. She will also do meet and greets in the Animation Courtyard and she will be part of the new Disney Junior Dance Party. 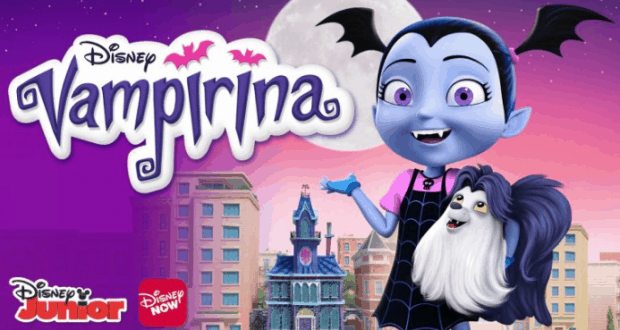 Here is a synopsis of the show if you haven’t seen it before: Vampirina blends spooky fun, heartfelt storytelling and Broadway-caliber music in stories that follow Vampirina (aka “Vee”) as she faces the joys and trials of being the new kid in town, including making friends and attending a new school in the human world. Along the way, Vee learns that it may be easier to blend in with her peers, but it’s more valuable to celebrate the qualities that make each individual unique. Vampirina will also be making an appearance at Disneyland Resort in California for the Halloween season. She will be making appearances at Disney California Adventure Park starting on September 7th. She will also be at Mickey’s Halloween Party on select nights from September 19th through October 31st. She will also be a part of the Disney Junior Dance Party, too! We expect that she will be quite popular! Who can’t wait to meet her in person?